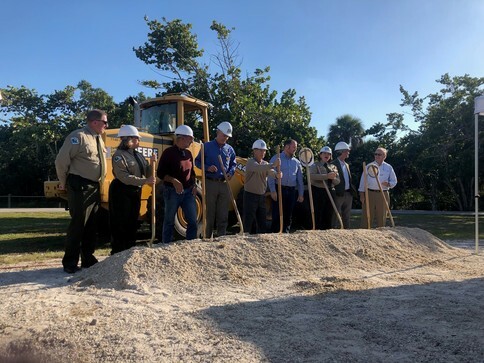 FORT MYERS, Fla. – Today, the Florida Department of Environmental Protection’s Florida Park Service joined former Florida Rep. Matt Caldwell, the Friends of Lovers Key State Park (FOLKS) and other local representatives for a groundbreaking ceremony announcing the construction of the new Welcome and Discovery Center at Lovers Key State Park. The park's citizen support organization, the Friends of Lovers Key, was instrumental in helping to secure funding for the center, which is expected to be completed in 2020. DEP received $4 million in state funding to construct the facility, and FOLKS will provide an additional $1.5 million for interior enhancements. The nearly 4,000-square-foot elevated Welcome and Discovery Center will feature a community room with seating for 75 visitors, exhibit discovery hall, bookstore, office space, wildlife viewing areas, covered teaching porch, storage rooms, access ramp and catering kitchen. "The Welcome and Discovery Center will be an engaging facility, providing opportunities for visitors to discover more about the unique habitats and wildlife found within the park, identify what they saw during their time at the park and find inspiration for conserving our public lands for generations to come," said Lovers Key State Park Manager Katie Moses. "The centralized location of the center will provide a wonderful community gathering place for visitors to begin their journeys to exploring and discovering all the different recreational opportunities in the park."